A listing is a text write-up about your business or one of your offerings, often accompanied by a logo , photos and video if available. It appears in various categories on the WhatToDo network of websites. The information in the listing aids in Search Engine Optimization for your company and your offerings when potential customers search for the products or services you provide. All WhatToDo advertisers get at least one listing – but one listing can show up in multiple places depending on how it’s categorized. One listing can appear in up to five different categories, which is the equivalent of five advertisements for your company. In the Web Content Admin, listings are divided into Activity Listings and Dining Listings. 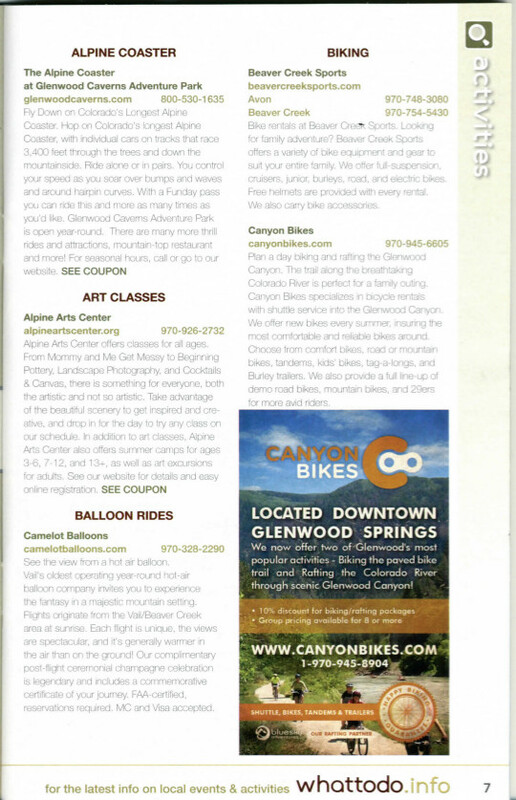 The catchall term “Activity Listings” includes activities, shopping, services…essentially anything other than dining. Listings and Dining Listings function exactly the same, so we’ll use the term “Listings” here to cover both. From your Web Content Dashboard, click the button for either My Activity Listings or My Dining Listings. You’ll be taken to a grid with a roster of your Listings. You can sort, search and customize this grid just like other WhatToDo grids. From the Listing roster you can view and/or edit an existing Listing or create a new Listing. To edit: From the Listings grid, click the Edit button at the far left of each listing, or click anywhere in the row for that particular listing. A new form will open up with that Listing’s specific info. To create a new listing, make sure the correct resort is displayed in the grey bar above the grid next to the box that says “Choose Resort.” Use the dropdown to change resorts, if necessary. In the box that says “Choose Item” select either Activities or Dining Listing. * Keep the title as short as possible while accurately providing all key info. * Put the most important info first because the Title may be truncated for size considerations. * Do not use all capital letters, all lower case letters or intentional misspellings unless that is a recognizable characteristic of your brand. Type in your “Listing Title.” Correct format: First Letter of Each Important Word Capitalized. Click the “Create New” button A new, mostly blank form will open up for you to fill out. NOTE: All new Listings will automatically show up as “Inactive.” This means that you can work on it all you want and no one will be able to see it until you publish it on the live website by making it active. Optional Tag Line – your “hook” that gives a brief summary of your Listing in one sentence. It tries to generate enough interest that readers will continue reading the full Description and contains different information than the Listing Title or Description. On the live site, it will appear like a subtitle under your Listing Title. There is no specific size/length restriction for this field, HOWEVER web visitors have a short attention span! You’re better off keeping this content engaging and as short as possible while still providing complete information. NOTE: If you’re cutting-and-pasting this text from another source (such as your company website) please paste it into a text-only file (such as Notepad or RichText) and save the file FIRST. THEN you can copy it and paste it into the WTD form to remove all unwanted web formatting. Listing Location – A Listing may have more than one location, but it needs AT LEAST one Active Location to appear live on the WhatToDo network. You can edit existing locations (with the yellow pencil button) or create a new location by selecting “Add New”. You can also place your listing so it shows up where you want it on the map. You do this by clicking the map thumbtack button in the green box, then dragging the pin to map location you choose. Category with Subcategory – A Listing may have UP TO FIVE Categorizations but needs AT LEAST one to appear live on the WhatToDo network. The Category/Subcategory is the primary way a potential customer will find your company’s info. To delete an existing Category/Subcategory, click the red box marked with the “X” to the right of the row. 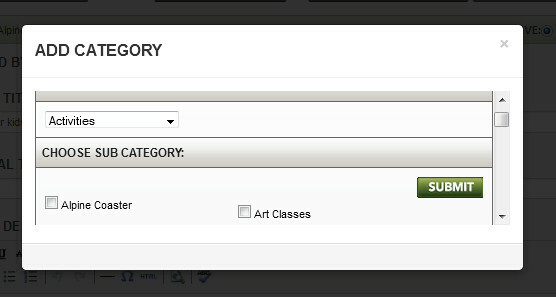 To add a new Category/Subcategory, click the grey “Add New” button to the top right of this field. You cannot do a category without a subcategory. Every Category must have a Subcategory selected or it won’t appear on the website network. Try to find a Category/Subcategory that is somewhat appropriate for your Listing. If you find nothing that matches, you may request a new one be created by clicking the “Contact WTD” button at the top or bottom of the page. Tips on Categories & Subcategories. When you have filled out the form completely, you make click the “View Live” button at either the top or the bottom of the form to preview how the Listing will appear to potential customers on the WTD network. Make sure everything is correct. Once you’ve edited and reviewed your Listing, make it “Active” then click the “Next” button at either the top or bottom of this form to me taken to the Media gallery, where you’ll determine what logos, images and/or video appear with this Listing. Every Listing in WhatToDo must have at least one Category with a Subcategory. The system won’t allow you to delete the last Category/Subcategory if it’s the only one listed. If that’s the case, you’ll need to add a new Category/Subcategory first, THEN delete the unwanted one. NOTE: You must select BOTH a Category and a Subcategory. Listings with only a Category selected will not appear on the live WTD website. If the appropriate Category/Subcategory is not listed in your form, click the “Add New” button on the top right of this field. NOTE: There are many different Categories and Subcategories combinations available. For example “Arts & Crafts” is available under “Family Fun” Category and “Art Classes” is available under “Activities” Category, and it’d be best to list it both ways. Please take a moment to read through your options before making your selections, recognizing there may not always be an exact match. If there is nothing available that can be used for your Listing, you may contact us to recommend additional Categories or Subcategories. You may check up to five Subcategories for each listing. They may all be listed under one Category or in different Categories. There are a number of things that will keep your item from appearing on the live website. If you believe you entered an item but can’t see it in your Web Admin, change the grid setting to show “All” or “Inactive” and make sure your business name appears correctly in the “Business” field. You can also search for it by key word. Find the listing that is not appearing on the live site and open it. Is there an Active Location? Is there at least one Category AND a Subcategory selected? You must have BOTH. Does it appear correctly when you select the “View Live” button? Please fix any errors you’ve discovered then refresh your browser open to the WhatToDo network and check again. If your item still does not appear, please contact WhatToDo and be as specific as possible with your question, including Business name and item Title.